If you’ve ever seen the 1940’s classic Casablanca you’ve probably fantasised about starring in your very own Moroccan-based love affair that plays out in an iconic gin joint, or you’ve dreamt of sipping something on the rocks while a Sam-like character tinkles ‘As Time Goes By’ on the piano. Even if you haven’t seen the flick, you’ve likely had a hankering for that one go-to spot where you can score your favourite drink, feast on your favourite food and return over and over again like it’s a second home. We’re talking about somewhere that’s a proverbial safe haven for work-weary locals. 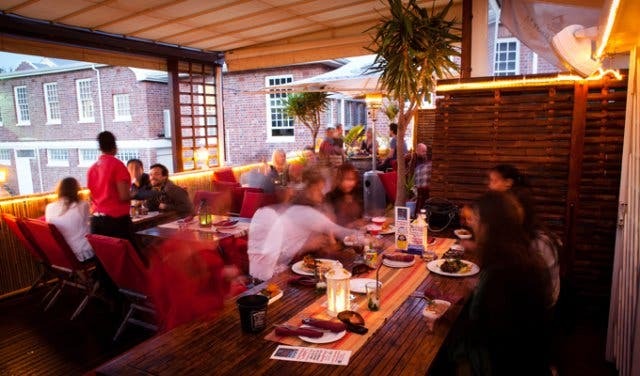 Enter Per Menkö, the owner of the Mother City’s very own Rick’s Café Américain, and though he’s not Humphrey Bogart or Rick Blaine himself, the seasoned chef has afforded Capetonians and out-of-towners their own Casablanca experience on Park Road just off Kloof Street. On the night my partner and I visit this popular institution, it’s a characteristically cold winter evening, with the wind swirling and wailing loudly through the trees. 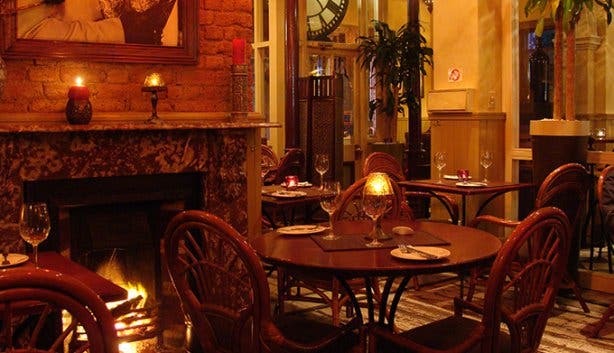 All of that somehow disappears as soon as we step through the doors of the restaurant and get struck with a warmth permeating from the three open fireplaces. There is an excited energy and the jovial hum of diners and drinkers filling the dark-wooded room around us. “It’s my favourite movie,” Per says when I ask about the eatery’s inspiration. “The script was voted the best in the 20th century and it’s got it all – revenge, love, drama.” He adds that he chose the motif because he spent a few months travelling around Morocco in a VW van during the 70’s. 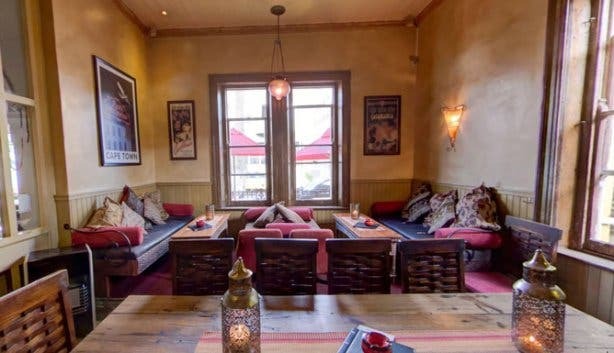 The eatery is housed in a 100-year-old converted Victorian building and basically transports those who enter to a North African oasis complete with ornamental lanterns hanging from above and different coloured hookahs lining the extremely impressive bar. Naturally, there’s a TV screening the black-and-white Ingrid Bergman and Bogart film in case anyone didn’t quite catch the Casablanca reference. The deceptively large space has many different nooks and dens for diners to hide away in, and I imagine that during the warmer months its rooftop bar is simply abuzz with sun-soakers and colourful cocktail drinkers. 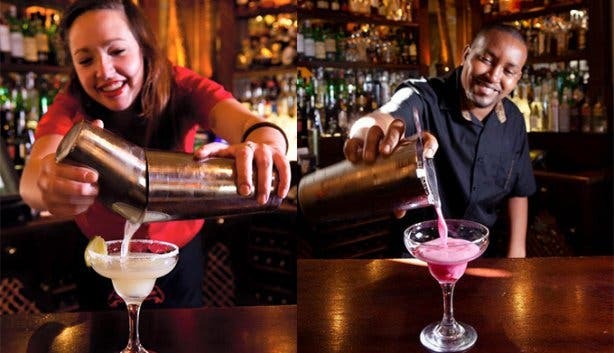 The joint is among one of the top drinking spots in Cape Town, both because of the vibrant, happy atmosphere and the fact that there are more roughly 600 beverage options – from wines, whiskies and apéritifs to brandies, beers and cocktails – to suit every drinker on any budget, not to mention Rick's boasts more than 30 different varieties of tequila. While I decide to go for a local Shiraz, my American dining companion, who spends several mesmerised minutes looking at the multi-page drinks menu, is happy to find a whisky from the States that he’s been missing since coming to South Africa. Once the matter of what to drink is finally out of the way, we turn our attention and our stomachs to the food menu, which is surprisingly diverse – it has dishes to seemingly suit any occasion. A quick survey of the eatery reveals a table of girlfriends on a catch-up dinner date, each of whom orders a different kind of burger (including ostrich and veggie), and a large group of twenty-somethings nearby sharing several plates of tapas, with morsels like olives, calamari and beef carpaccio being passed around. My companion and I decide that, in keeping with the Moroccan spirit of the restaurant and to warm up from the inside, we’ll try the famous Rick’s tagines. 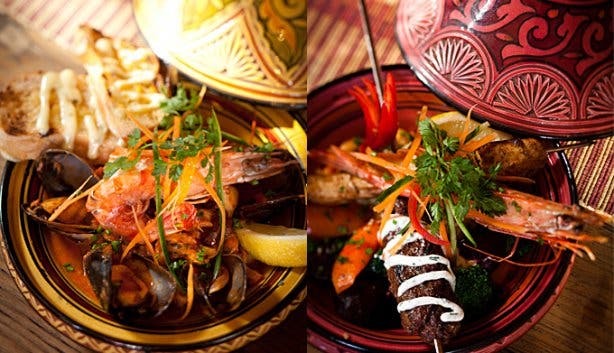 My partner pairs his beloved whisky with a fragrant and rich lamb tagine with dried apricots, almonds and walnuts, while I opt for the Spanish-influenced seafood stew, which is generously populated with mussels, linefish, calamari and prawns. The eclectic menu is curated and designed by Per himself, and with cooking experience from all over the world, including a stint as executive chef at the Victoria & Alfred Hotel and time at the Mount Nelson, the Bavarian-born entrepreneur could have gone for fancier, fine dining type of fare for Rick’s. But the truth is, he preferred to design an accessible, uncomplicated menu with honest, good food for Capetonians to enjoy. Plus, he adds, “I’m a hands-on guy and I enjoy being in the front. The main thing is that people want to come back and bring their friends for sundowners, for entertainment or for lunch.” It’s all very Rick Blaine isn’t it? There is no more room for eating and drinking, and we’ve stretched out the evening for as long as it can go, so it’s time to say a fond farewell (for now) to Rick’s. Out in the reality of the rainy street I’m already fantasising about the next time I come here and I’m thinking that, just like an old favourite movie, a visit to Rick’s Café Américain is both a comfort and a pleasure. 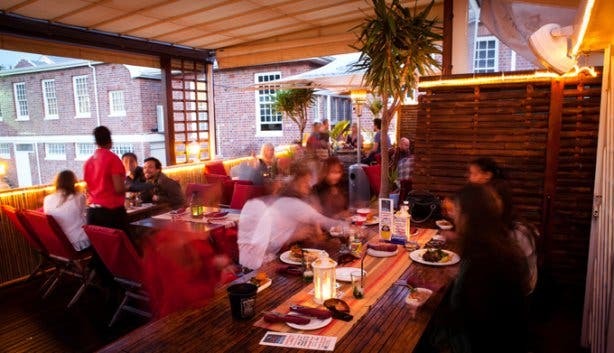 Tip: Not many people know about Rick’s upper deck, which is an excellent spot for sundowners in the summertime thanks to the stunning view of Table Mountain. Also, Rick’s has free Wi-fi! The Bill: Prices are reasonable – tapas range from R58 for fish cakes to R105 for smoked crocodile (exception: a platter costs R165), while mains range from R89 for a falafel pita to R215 for a seafood tajine (exception: a 300-g fillet steak with veggies and a starch costs R245). As mentioned, there really is a wide variety of drinks to suit all kinds of pockets. 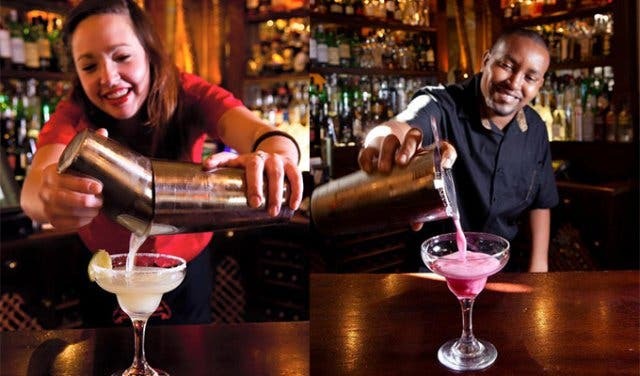 Follow @RicksCafeCT for the weekly R69 lunch specials on offer at the eatery, or if it’s drinks you’re after, read more about the happy hour special.